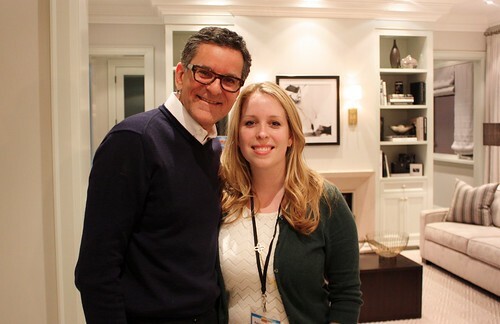 Earlier this week, Garrett and I were invited to tour the Dream Home up for grabs this year through the Princess Margaret Cancer Centre’s Welcome Home Sweepstakes. This beautiful $3.7 million home was created in collaboration with the fabulous Canadian designer, Brian Gluckstein, including many pieces from his Gluckstein Home Collection. It was such a treat to get to tour the new house this year. Walking up to the house we were in awe – a beautiful boxwood hedge, copper trimmed roof, large pillars and intricate stone work. It’s hard to believe that it all went up in only a few months. 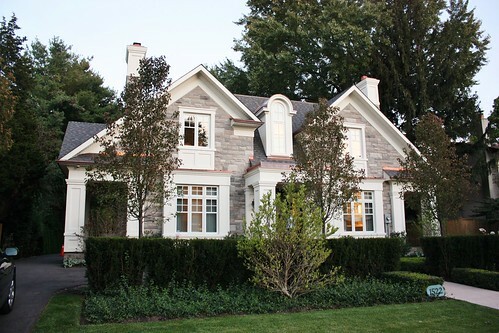 Crews were working around the clock to create this stunnig home. 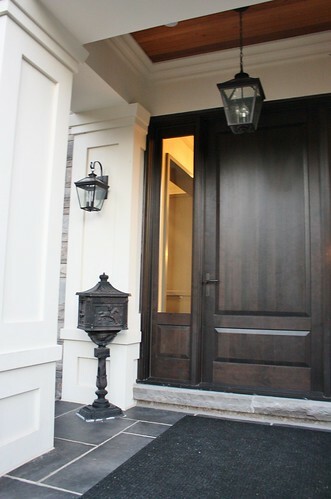 I loved the cast iron details on the front porch, paired with the thick moldings, planked ceiling and a beautiful dark wood door. As night fell, you could see from the backyard how large all the windows are and how it let’s in so much natural light during the day. It was a pleasure to meet Brian and talk to him about the wonderful work he had done in the house. He was incredibly personable and easy to talk to. He even congratulated us on the engagement and offered advice on creating our wedding registry. 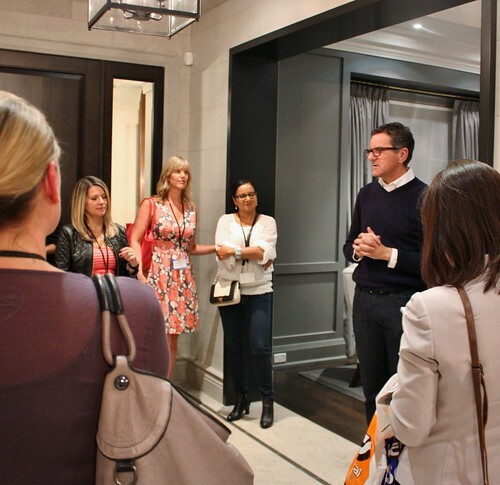 He gave a great informal tour of the house and Q&A with all the bloggers who attended that night. It was facinating to hear all about the process of building a house of this magnitude and then decorating it using a combination of expensive vintage pieces with his reasonable Gluckstein Home Collection. 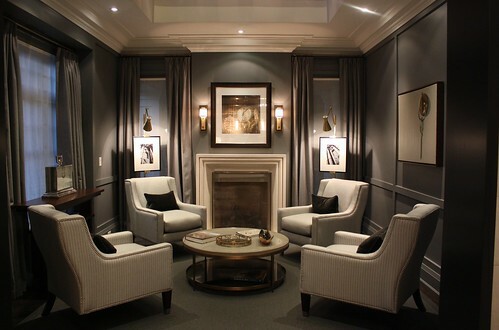 The dark and sophisticated sitting room. 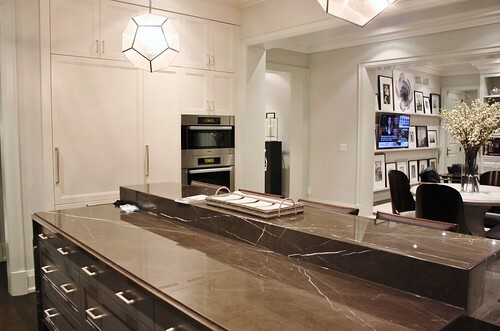 This would be a great spot to entertain guests during cocktail hour. Across the hall, this bright and airy living room offers a great contrast. 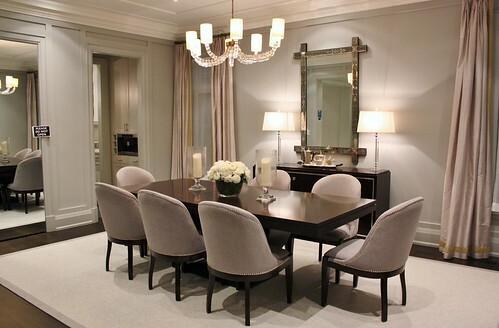 The dining room features gorgeous dove grey chairs with metal nailhead finishing along the edge. The kitchen, oh the kitchen. It’s a food blogger’s dream with lots of natural light, large workspaces and luxe details. 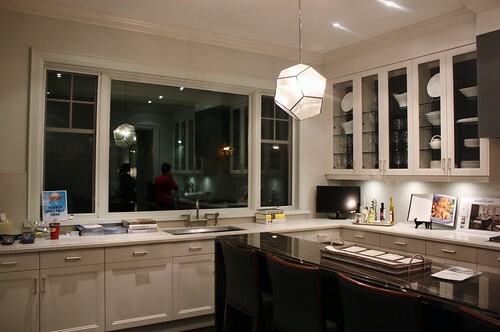 How awesome are those light fixtures? Can you spot the fridge? It’s masked by those great cupboard doors beside the double ovens. 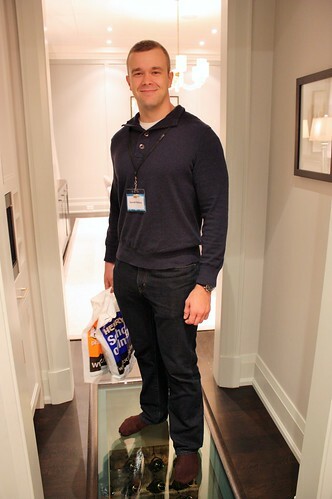 Garrett spotted this little surprise – a glass floor in this small hallway between the kitchen and dining room. 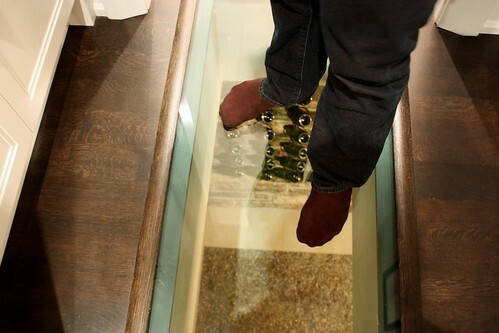 It shows you the “zen garden” wine cellar below. Across from the kitchen is this beautiful family room. with a mudroom on the left and a home office on the right. 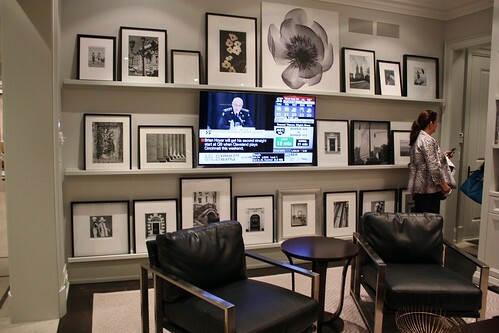 The TV was nestled in among this eclectic gallery setting. By far, our favourite room was the theater room. Garrett said he could see us spending all our time down here. 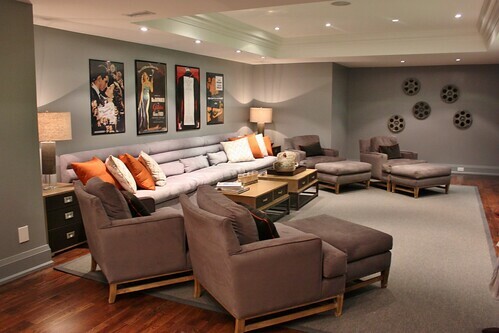 Rather than doing tiered seating, they placed the chairs and ottomans on an angle, to still give that movie theatre feel, but keep it a functional family room as well. 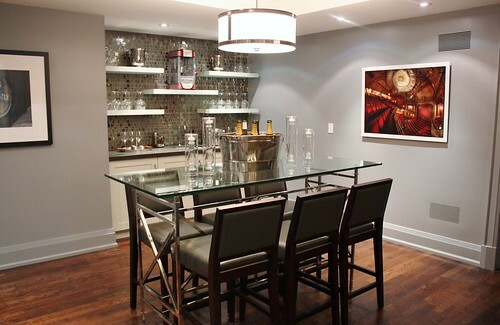 Across the room is a wet bar, complete with a vintage style popcorn machine and the wine cellar to your right. 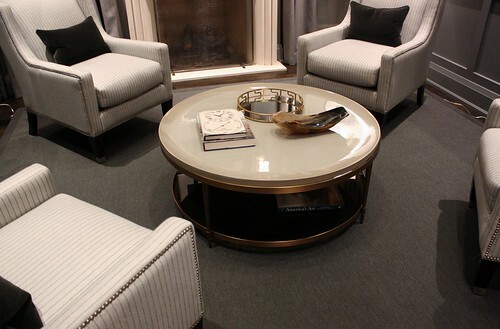 Wouldn’t this be a great informal party area? A personal gym in the basement with a big TV, water bottles and towels. Who needs a gym membership when you have it at home? Upstairs, there are 3 bedrooms, with an atrium hallway that leads to the impressive master suite. I could have jumped onto that bed and sunk right into those pillows. There is a walk-in closet that goes around behind the bed, with doors on each side. 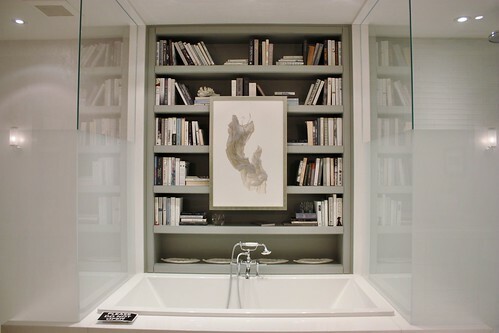 You would not believe the storage in this house – there is a place for everything! The big master suite bathroom, with a deep tub, flanked by a glassed-in toilet on one side and a shower on the other. And there are HEATED FLOORS. 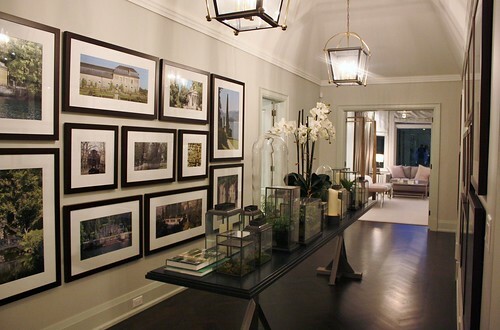 For more photos from my visit to the Dream Home, visit the photo album. There is a great source guide too if you see something you like. Oh my heavens, the home is simply stunning! Dreamy! 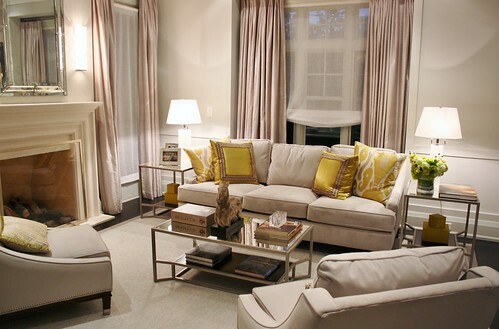 I love the show home. I would like to know if I could see a floor print. And could you please tell me the square foot aged?